A new class of social media management platforms for small businesses makes social media marketing — such as posting to Facebook and Twitter — much easier. Postling emphasizes posting content across wide network. Postling allows users to publish content to almost every popular social media platform — Facebook, Twitter, LinkedIn, WordPress, Tumblr, Flickr and a number of others — as well as to rating and review sites like Yelp and CitySearch. Postling users can schedule posts to any or these networks in advance, a feature that is common in almost all social media management tools. The dashboard itself is well designed, intuitive and easy to use. All posting capabilities — blogs, status updates, video or image uploads — are located in the left-hand sidebar, as is a menu of the sections contained in the dashboard, such as analytics and published posts. One unique feature is that comments left by readers on blog or social network accounts are placed on the home page of the dashboard, enabling users to respond from within Postling itself. That is truly a time-saver as it prevents the need to visit each social network individually. 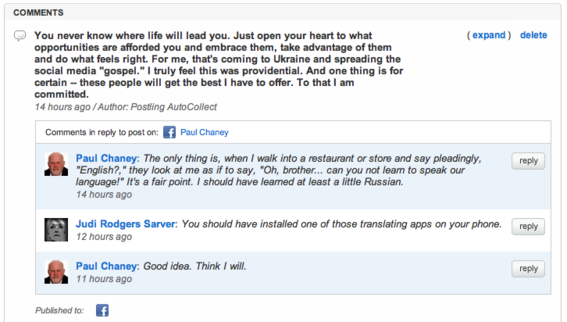 Postling includes comment stream on dashboard home page. Another of Postling’s features is the ability to publish a single-page website containing the user’s Twitter feeds, blog posts, Facebook updates, and biographical and contact information. Think of it as a social media profile or “hub.” Unfortunately, there appears to be no way to customize the page by adding graphics or changing color schemes, so its usefulness as a marketing tool may be limited. Postling supports multiple users so that more than one person within a company can contribute content. Permissions can be set on each user to provide editorial control over the publishing process. Also, social media accounts can be organized into separate identities, which Postling refers to as “brands.” For example, a user can maintain his or her personal social media accounts under one brand and business accounts under another. Users are sent a daily email containing a digest of activity on the social networks from the previous 24-hour period. The platform also provides monitoring capabilities, allowing users to track keywords like the business name or competitors’ names. Users are notified via email whenever any mention of those keywords is discovered. One shortcoming is in the ability to see new Facebook Fans and Twitter followers. Postling places value on quality over quantity in that it lists new followers individually on the dashboard’s home page based on their degree of influence as determined by Klout, a popular Twitter influence measurement application. However, Postling provides no place to see a list all new followers at once, which would be a nice feature to have. Also, even though Postling has an analytics dashboard, the information is very basic. A more comprehensive, detailed set of analytics would be a welcome enhancement. Starter is free but only supports a single account, one brand and one user. Plus is $9.00 per month and supports up to three accounts, three brands and three users. Premium is $49 per month and designed for those who manage multiple accounts. It supports up to five accounts, five brands and an unlimited number of users. In my opinion, the Plus account would provide everything a small business owner would need. In short, Postling is a comprehensive social media management platform that is reasonably priced and easy to use. Breeze Social focuses on saving time. This option is for those who have content ready and are ready to publish. The posting interface allows users to add images, schedule posts, and choose the social networks to which content should be distributed. Those who are pressed for time or need help in deciding what to post can use this option. Content suggestions based on company profile, industry, location and competitors appear in rotating order above the posting interface. Alternatively, users can choose from a row of buttons that, when clicked, return relevant content suggestions based on activity within their Twitter and Facebook accounts. Breeze Social content suggestion buttons. Breeze Social lets users interface with a more limited number of social networks — Facebook, Twitter, LinkedIn and Tumbler at present — than Postling. Like Postling, Breeze Social offers users the ability to post to multiple accounts. There is also no way to see new Fans and followers. Breeze Social’s goal, according to the company, is to make posting a “breeze.” Due to its lack of features, however, I find it less useful as to tool to manage a full social media engagement program. But the platform is free, which is good. Roost has its origins in real estate. Roost came out of the real estate industry as a search engine that listed properties available for sale. However, in recent months the company has abandoned that business model and recreated itself as a social media management technology provider. The platform is oriented around creating social media “campaigns,” which are series of posts scheduled over a defined time. Like Breeze Social, Roost provides a content library to aid the user in generating ideas for posts. Roost’s interface steps users through a campaign-creation process that starts with the destinations to which content will be posted. The platform supports Facebook and Twitter. Following that, users decide the length of the campaign, from 1 to 30 days. Roost then provides several categories of content suggestions, including ideas for links, status updates, quotes, questions and photos. A unique feature is something Roost refers to as “My Circle,” which is a network of friends on Facebook, who the Roost user then invites as “My Circle” members. When users post messages to Facebook or Twitter, My Circle members are notified and encouraged to share the post with their respective networks. Roost is still tied to the real estate industry, but any small business can use it. Essentially, it is a posting interface to save the user time and relieve the burden of social media management overload. As to price, Roost bills itself as “Free Now, Free Forever,” although there is a premium version intended for use strictly by Realtors. 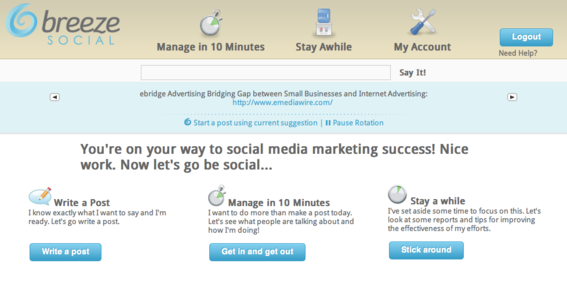 Sendible combines social media with email marketing, CRM and SMS. Sendible is, by far, the most comprehensive of all the social media management platforms included in this list. It combines social media with email marketing and SMS (text messaging) technology. The platform provides support for an extensive list of social networks and includes: social bookmarking sites such as Delicious; photo sharing from Flickr and Facebook; and location-based social networks like Foursquare. Sendible pulls in posts and comments from sites like Facebook, Twitter and Flickr so that users can respond from one place. Each post is analyzed and messages that need urgent attention are highlighted. The platform provides a detailed set of analytics and even facilitates the use of Google Analytics. 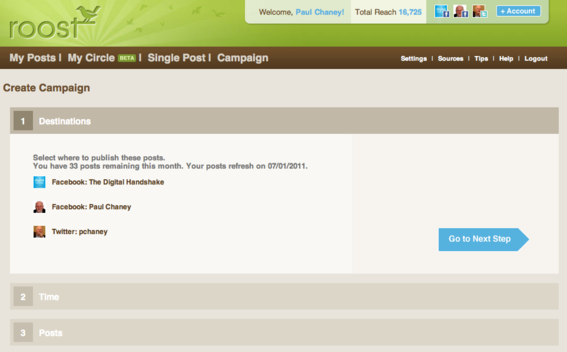 It tracks clicks, referrers, shares, comments and more. 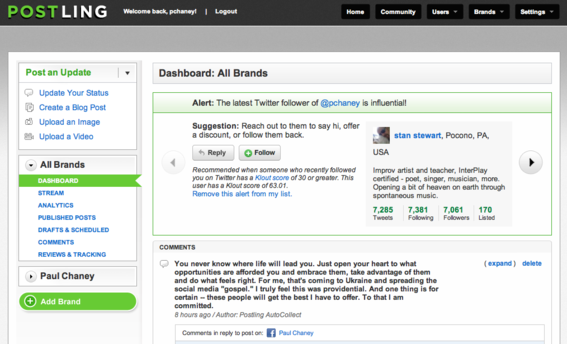 For merchants who want to track the return-on-investment of social media, this integration is very helpful. In addition, users can check what’s being said about their brands on blogs, news sites, social networks, and in comments. Sendible’s sentiment analysis highlights the mentions should receive a response. Lists of contacts can be uploaded and organized into groups, which makes Sendible a social customer-relationship platform that can be used in concert with its email marketing and SMS functions. Due to its robust nature, the interface takes some getting used to. Each primary function appears in a horizontal row of tabs across the top of the dashboard, with contextually relevant menu items located in the left-hand column. For such a comprehensive tool, the pricing is surprisingly affordable, starting at just $9 per month for one account. The most popular options run about $20 per month. Social Guides focuses on social commerce. A newcomer to the social media management scene is Social Guides, which is designed to combine social media and social commerce applications into one platform. Run an exclusive social deal. The dashboard controls all engagement activities, including scheduling and posting status updates, creating a custom Facebook Welcome tab using the fangating option, and running social deals. The interface reminds me of Postling in that everything is organized into a clearly visible menu of options. Also like Postling, it has a list of all the comments from Twitter and Facebook that reference the user. There is also left-hand sidebar that contains a list of top Fans, a lightweight analytics widget, and an overview of the user’s engagement activity. New Followers. A list of recent new followers. What separates Social Guides from the other platforms in this list is its use of social commerce. Merchants can offer deals in one of two forms: special discounts and exclusive offers to Fans and followers. The interface used to create the deals is simple and requires only three steps. First, the merchant chooses the offer. Second, the merchant defines the offer’s details. Third, the merchant schedules the dates and times when the offer will run. Again, like Postling, Social Guides has its own form of a publicly-visible social media “hub” that users can promote if they choose. 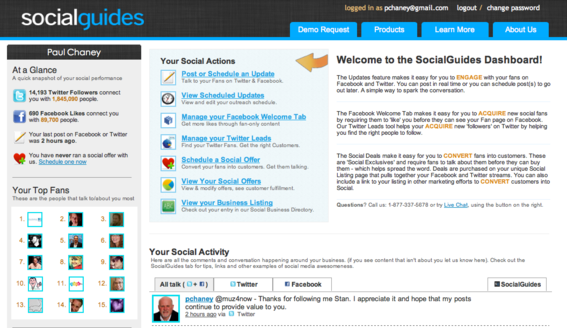 Social Guides is free; it is powered by WordPress. Each of these platforms comes with its own set of special features and benefits. Postling is comprehensive and very affordable. Breeze Social and Roost focus on saving the user time by providing relevant content suggestions. Sendible is the most comprehensive platform of all and integrates social marketing with email, SMS and CRM. And Social Guides distinguishes itself by focusing on social commerce.